One of my friends recently started a running club with two other women in the small coastal town that is just over the hill from my house. The club had a modest start - just a Facebook page and a series of emails inviting people to join. I am not typically a "joiner" of such clubs or groups, but this whole blogging thing has made me more open to doing things like liking people's Facebook pages and posts and joining Facebook groups - crazy, I know. 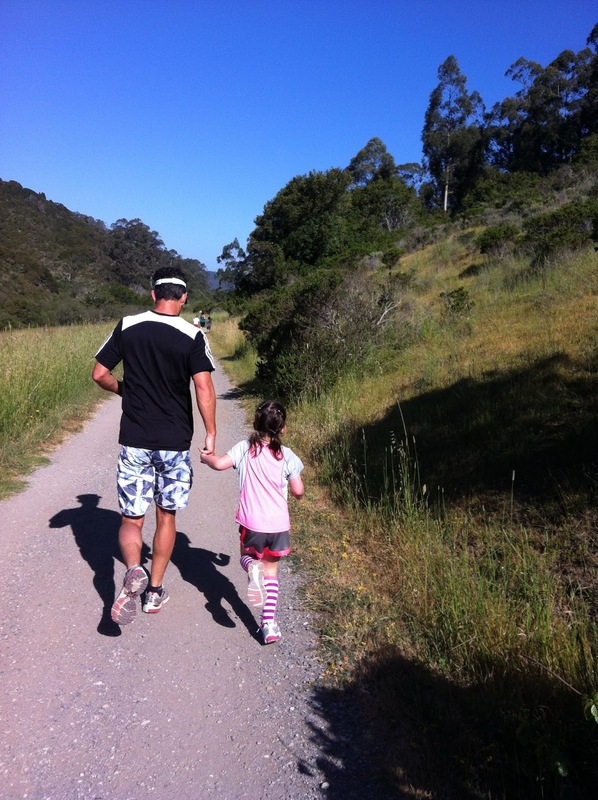 So, pushing personal issues aside, with one click of a button, I joined the Pacifica Runners. The cool thing to see is that apparently there was this completely organic need within the community for such a group. Within the space of a couple weeks, the ranks had swelled to 69 members and they had organized their first Fun Run Event - a 5K and a kid's race. In today's world of virality, 69 may not seem like a big number, but considering that this is a pretty small town and that the draw here is not a give-away or a funny cat video, but a celebration of sweating, I think it is pretty amazing. My entire family (along with about 45 others) showed up to support the first Pacific Runners Fun Run Event this Sunday morning. After the first 5K I did with my daughter, my husband was pretty bummed that he had not run with us. 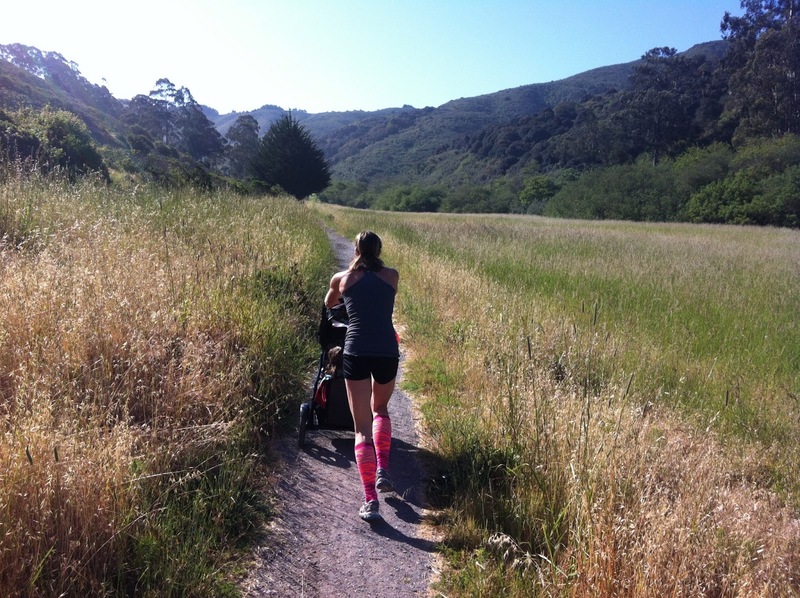 So, after noting that he was pretty sure that he would at least be able to keep up with our daughter for three miles, my husband agreed to join us. The plan was to run it together - me handicapped by pushing the 90-lb plus double stroller, and him handicapped by the fact that he hasn't run since December, unless he has been chasing some sort of ball. Then, the kids would get to run in their own, much shorter race. We would have brunch with our friends afterwards, and then beach it or head home depending on the weather. Rarely do our plans and the actual execution of said plans match up - but today they did. 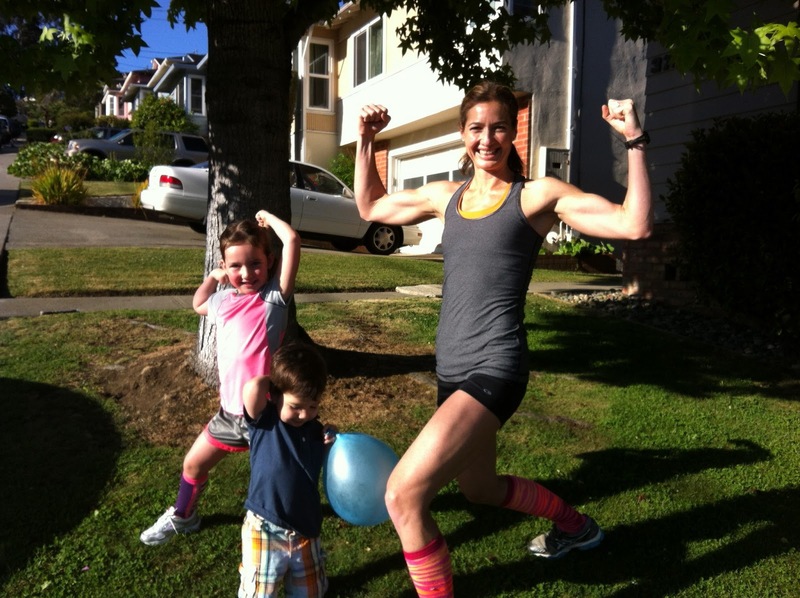 This morning, my daughter and I got decked out in our running knee socks and matching ponytail hairdos. 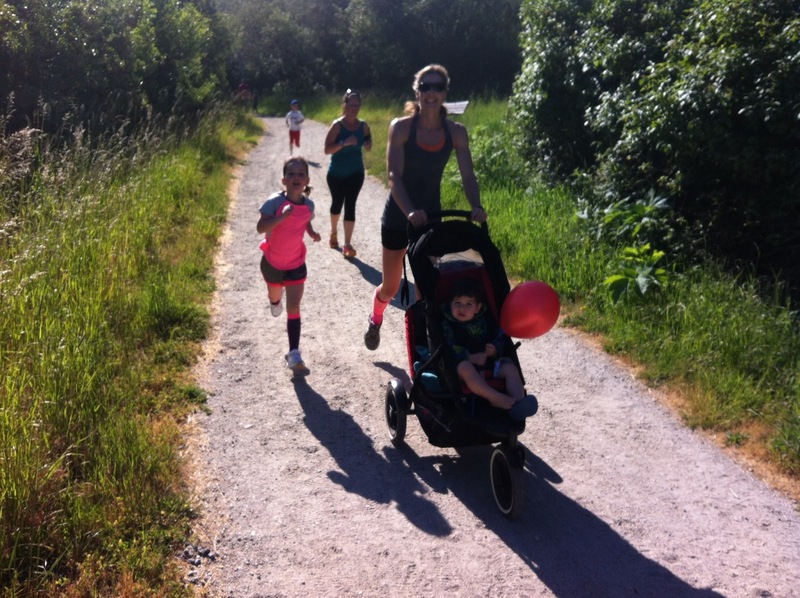 All four of us snacked on bananas and granola bars on the way to the run and were greeted at the start by multiple families that were also out in force - the littles in strollers and the biggers planning to run it solo. Wow, look at all the kids my daughter said with delight. The course sampled several of the shorter, flatter trails in San Pedro Park, a beautiful open space preserve that backs into the coastal hills. Everyone ran at their own pace and cheered for each other in passing. 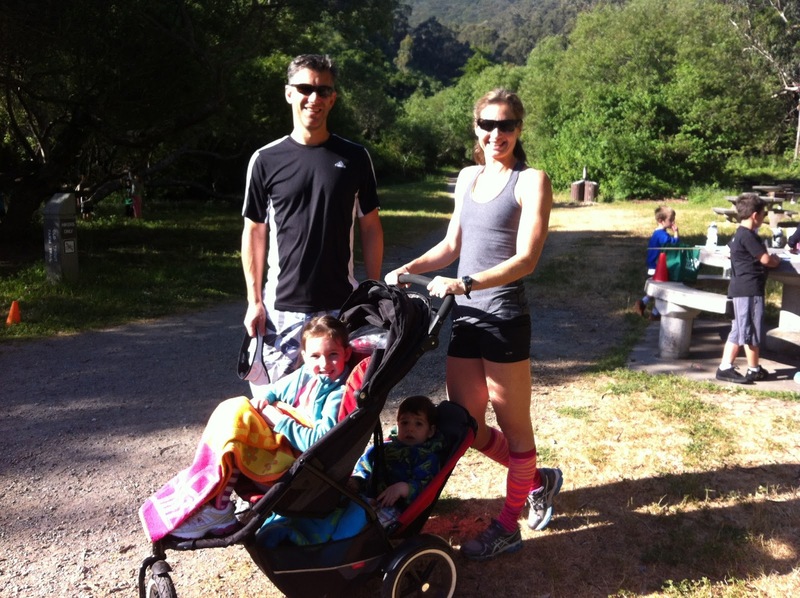 In our case, we did a lot of alternating between stroller running, kid-paced running, and some wildlife watching. By the end, everyone felt a little sweaty, pretty tired, and very proud to have completed the run together. After the last family made it back to the start, a kid relay ensued wherein each kid (at least once) madly dashed about 30 yards to a turn-around and then high-fived the next participant at the return. There were a few casualties marked by smudged faces and skinned knees, but overall the "Rug-Rat Relay" was a great success too. After the race we met our friends at a local brunch spot to enjoy pancakes and eggs. Of course, at least one other runner family had the same idea, and so the camaraderie of the event carried over into the post-run brunch. The fact that something sprang up that was so organic and so nourishing to building a healthy and supportive community is very cool. It really was a pleasure participating as a family in today's event and I wish that my city had more of a similar similar ethos. 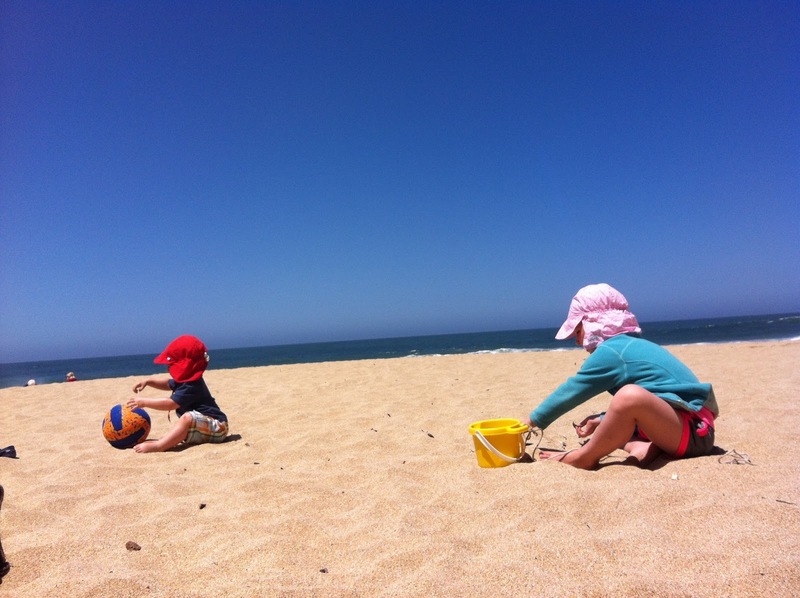 I guess until it does, we will just be interlopers in Pacifica (we also like their beaches). Nice work ladies in making it happen today. Obviously, it was what we all needed. You guys were awesome out there! I remember being super jealous of the mother/daughter knee high socks wondering if I can can convince my son to wear them:) Thanks for coming!! !